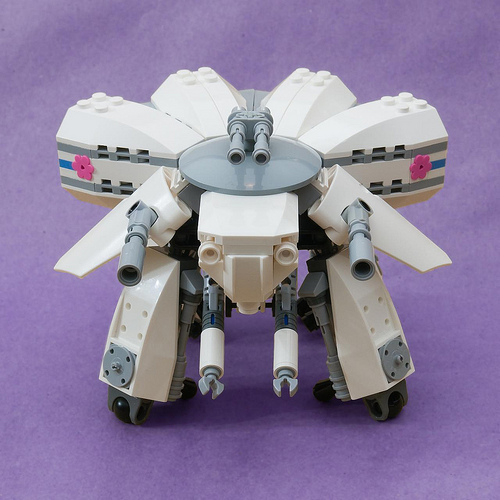 We may be guaranteed never to see official Ghost in the Shell LEGO models, but that doesn’t stop LEGO fans from building their own Tachikoma, Fuchikoma, and other “Think Tanks” during what is now the annual Marchikoma challenge. 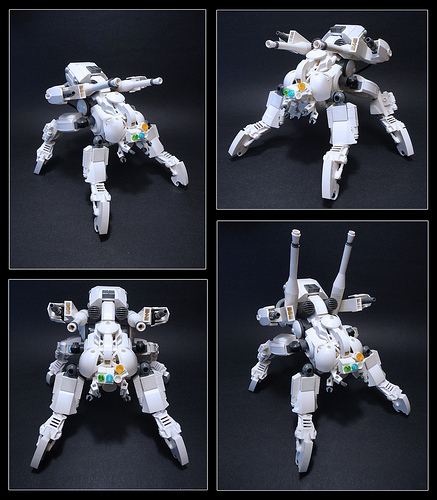 Chris (Ironsniper) puts the new olive-green LEGO elements to good use with his own entry, full of great shaping despite the limited parts palate. The light and dark grays Chris uses for the non-olive portions are a great example of using different shades of gray to mimic different types of real-world metals — a subtle type of color-blocking missing from less-sophisticated builds. Well a 400k piece castle and a drawing robot are tough acts to follow, but this was simply too nice not to share. 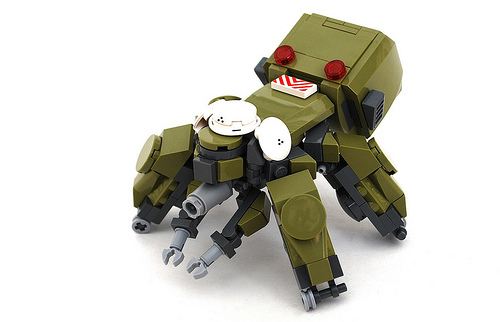 Not only is Dane E’s (Mechanekton) Fuchikoma a really great example of the iconic A.I. machine, but the setting that he placed it in is absolutley stunning. By utilizing a clean sterile backdrop with a few perfectly placed ‘props’, Dane has created a scene that literally had me saying ‘WOW’. With FebRovery coming to a close, we can roll (pun intended) right into Marchikoma…and Dane certainly has got my creative juices flowing. 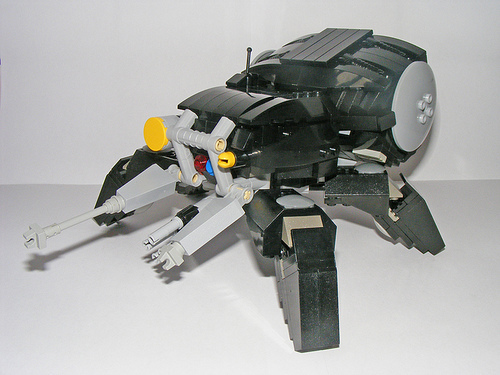 Although I’ve been behind in my blogging lately, it seems like practically everything I add to my “to-blog” list is some form of think tank (tachikoma, fuchikoma, etc.). 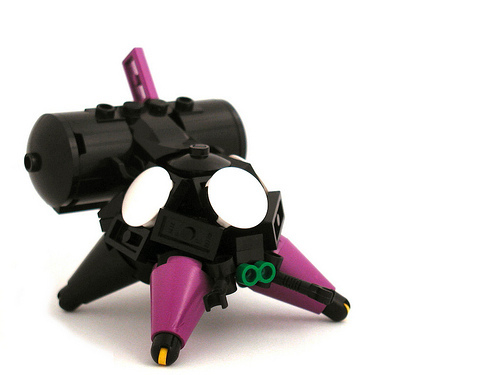 Crawling out from under my rock, I discover that there’s a contest going on, called Marchikoma. There are some pretty nice entries floating around, and here are some of my favorites. 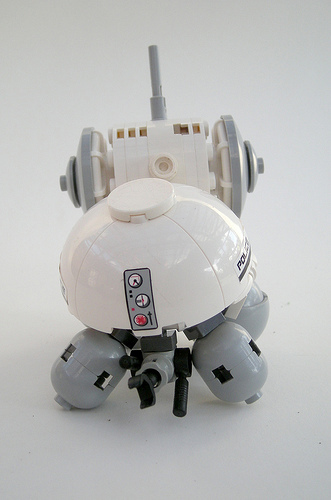 Don’t ask me why I keep finding sci-fi creations that can pass for cute lately. Perhaps the holiday season is making my heart soft. 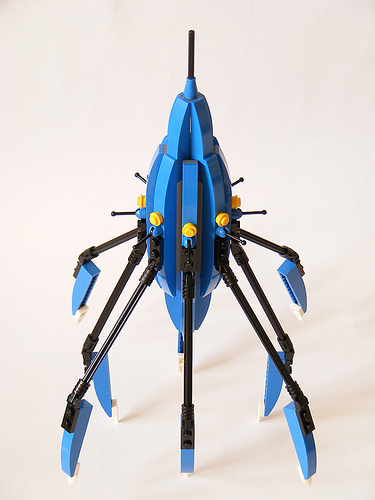 Regardless, here’s an interesting, and cute, take on a Fuchikoma, by Dane Erland. 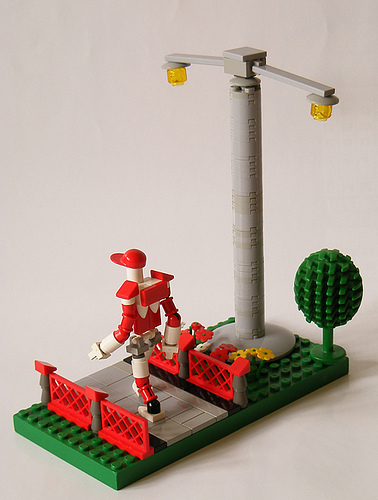 Norbi is a LEGO builder from Romania who just recently started posting his creations to Flickr. It’s not often someone demonstrates such strong skills from the very first photo posted online, but Norbi clearly has talent. Can’t wait to see what Norbi will show the world next.